Equipment Used: One homemade Red Hot Poker. Optional Equipment: heat-resistant/fire-retardant mitt and protective goggles. It all started with making the perfect hot buttered rum. What makes Dave and Nils so creative and driven is the fact that the two of them are incredibly fussy. They’re nitpickers. Food perfectionists. Cocktail fanatics. Fat separating from alcohol in what is supposed to be a hot, welcoming beverage has the potential to ruin their afternoon. Luckily, TIC Gums makes Ticaloid 310 S, a Gum Arabic and Xanthan mix that we used to emulsify melted butter, sugar, and water, effectively creating a butter syrup that could be held and mixed with rum to order. The syrup mixed with the rum into one smooth, homogeneous mixture. As with all things Dave & Nils, though, they couldn’t stop there. The drink was good, but it needed to be delicious. It came down to how we were heating the beverage. The traditional methods—boiling it in a pot or adding boiling water to it—heated the drink too slowly or watered it down. Instead, Dave wanted to immerse a heating element into the drink itself, thereby caramelizing the sugars in the beverage in a way that the other two methods wouldn’t.That’s where the original Red Hot Poker came in. 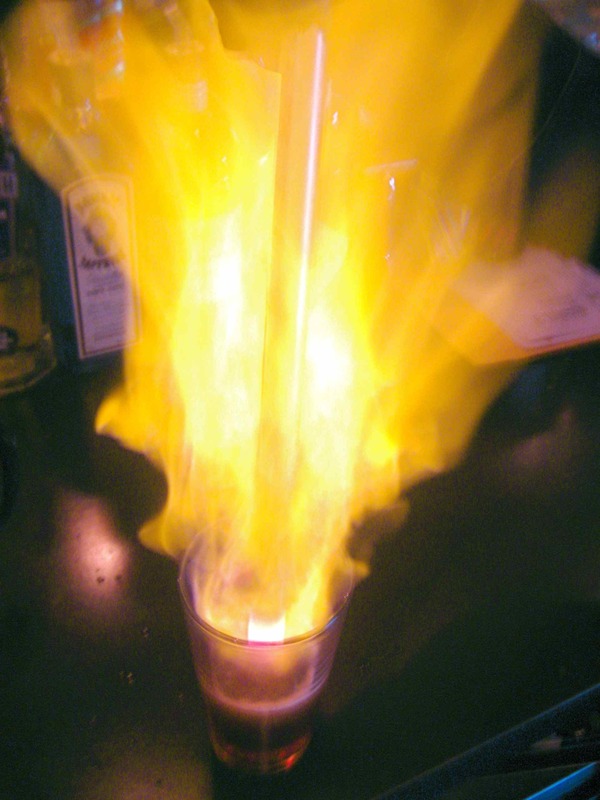 Its colonial ancestor is the loggerhead or flip-dog, a wrought iron rod with a heavy base that was heated over an open flame until red-hot, then plunged into a cocktail to heat and froth it. Antique loggerheads are hard to come by. Instead, we purchased pointed soldering coppers with wood handles from McMaster-Carr. (Dave recommends buying these new since used ones have most likely been used on lead.) 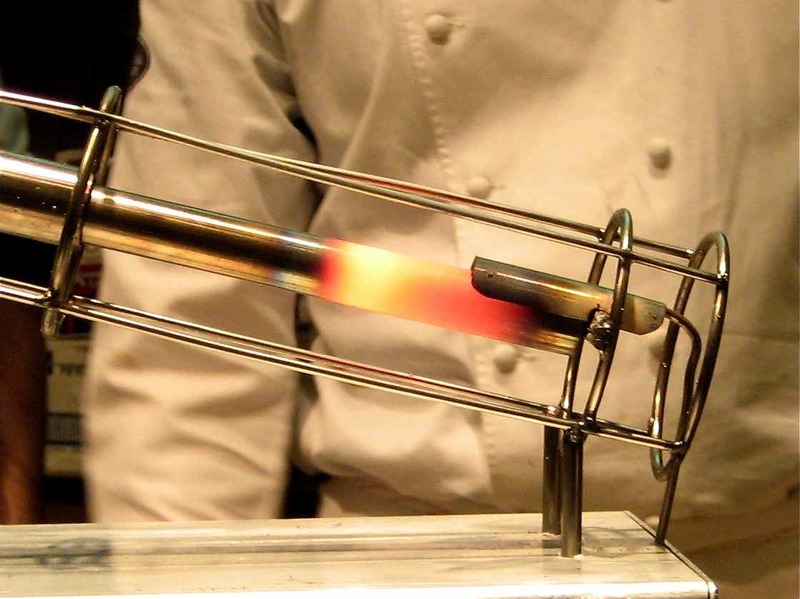 We heated the soldering copper directly over the open flame of the stove for 30 minutes, then turned the lights off. We figured that the glowing, red copper base was a good sign that it was ready to use. Dave plunged it into the hot-buttered rum mix with high hopes. Unfortunately, nothing happened. It was silent. No frothing or gurgling sounds. Dave looked down, perplexed, and gasped excitedly. “Oh man, this thing is so hot it’s instantly vaporizing the liquid around it!” No sooner had he made the discovery than the hot poker cooled enough for the liquid to reach it. It started heating and frothing the drink, spraying drops of hot liquor all over Dave who calmly said, “Ow. Ow ow. Hot. Ow. Please stop.” Dave’s pain was amusing and worth the end product—a hot, delicious cocktail. However, there were some issues with our test run. While still delicious, there was a faint copper taste imparted to the cocktail and there were particles of blackened debris left at the bottom of the drink. Dave tried substituting the soldering copper with slugs of cast iron & 316 stainless steel. We repeated the process: heat over open flame, submerge, and taste. The iron tasted like licking supplements (not delicious) and the stainless steel wasn’t a good enough conductor—it didn’t have explosive heat. So we went back to the soldering copper and created two solutions to combat the flavor and debris issues. First, we stamped the soldering copper into a bain-marie of cold water to both shake off some of the particles that we thought might be adding to the copper flavor, and then plunged it into the hot-buttered rum mix. Second, we decanted the cocktail into a serving cup, thereby leaving what particles weren’t removed by the previous step at the bottom of the heating container. The result was less copper flavor and no debris, leaving a pretty remarkable drink. 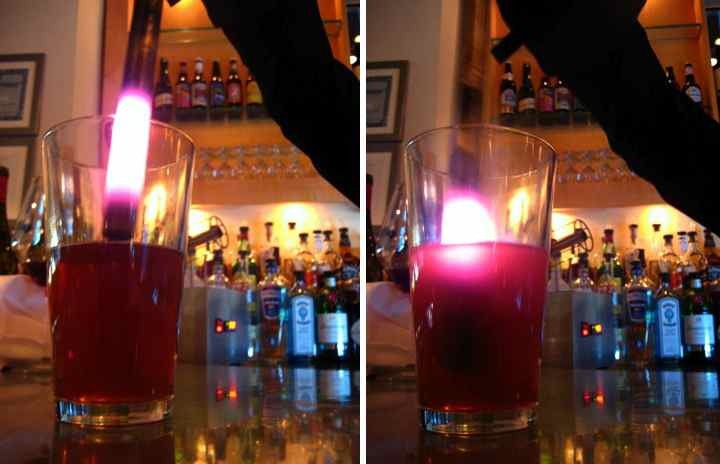 This mini-success led to another conundrum—how do we make this hot cocktail method readily available bar-side? After all, what good would this technique be if you could never use it at a bar during service? Dave toyed with another idea: heating small stones that could be dropped into a beverage, causing it to boil. He especially “liked all the potential puns you could make involving ‘rocks.’” He also enjoyed that this was the first method of boiling water that man had before the invention of pots that could sit over fire. The problem was finding stones that could withstand being heated without exploding. Dave tried “African Wonder Stone,” thinking that it might make the cut: “I put a 1 lb rock on the burner in a pastry kitchen and stepped outside to talk to someone. All of a sudden I heard this muffled pop. When I came back in, there weren’t any pieces left bigger than my fingernail… and they were everywhere.” Next up, river rocks from Crate & Barrel . This time Dave balanced a pot over them, which came in handy when these, too, exploded. His last attempt involved breaking up the lids from his Korean Dolsot bowls (made from Agalmatolite) into chunks, then placing them over the flame. They heated well and didn’t explode, but were expensive. When submerged in the cocktail, they frothed it nicely, but imparted an, albeit pleasant, mineral taste. (One of Dave’s interns recently found us small Agalmatolite stones, which is much cheaper than smashing more Dolsot bowls. We haven’t yet had a chance to put them to use.) Dave decided to return to the soldering coppers and tackle the obstacles that made them impractical for bar-side use. Once upon a time, bars used to have open fires where they could keep loggerheads on the flame, constantly heating. Dave thought about modernizing that idea by building small kilns that could be kept behind the bar to heat soldering coppers. It would need to leak just enough energy so that it wouldn’t melt itself down, but still be hot enough to heat the copper. His first kiln did get hot—literally white-hot—and instantly incinerated a chicken heart that he threw in to test the temperature. Once he turned it off he couldn’t turn it back on because it had basically melted itself. Dave began thinking about a way to control the temperature of the kiln and had one of his “ah ha!” moments. Why build a kiln to heat a soldering copper when you can put the heating element directly into it? The beta version of the portable Red Hot Poker was born. 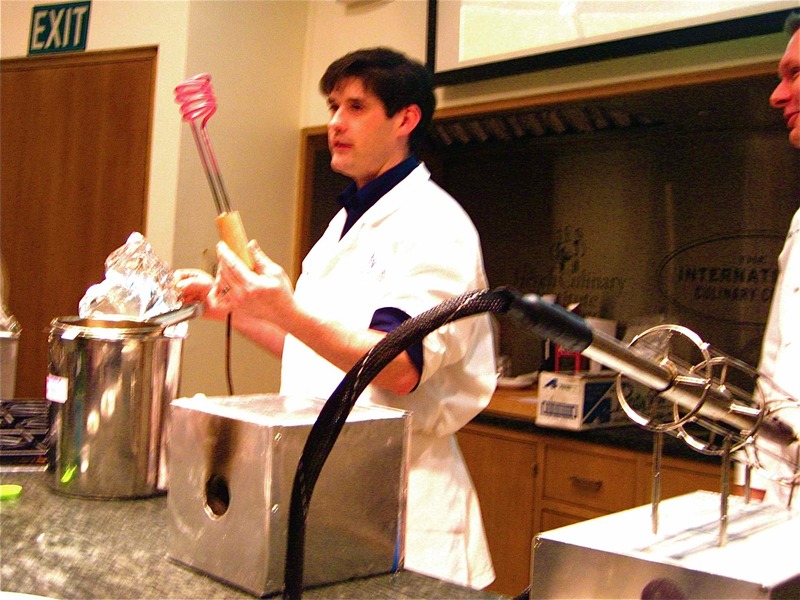 It had the same wood handle as the original, but instead of a copper weight, Dave bought a bendable tubular immersion heater from McMaster-Carr that had a nichrome inner heating element inside an incoloy (nickel and steel alloy) shell, and coiled it around on itself so that it could fit in a bain marie. It looked like the lovechild of loggerhead and one of those coiled light bulbs. Instead of heating it on an open flame, you just plugged the brown electric cord coming out of its handle into the nearest wall-outlet. It did get red-hot without burning out and didn’t impart any additional flavors to the drink. It still wasn’t bar friendly, however: it looked like a demented incandescent bulb; there was no holster so you either needed to hold it for 5-10 minutes while it was heating, or rest it in something that could withstand the heat; it didn’t recover fast enough between drinks to be realistic for bar service; and the length of rod between the coiled, heating end and the handle was super short, leading to Dave burning off more knuckle hair. Next, Dave purchased what would eventually be called “The Red Hot Poker.” It’s a Watlow Fire Rod with a 4” incoloy heated end. Unfortunately, he burnt it to death trying to see how far he could heat it. He then ordered one with an inner thermal couple to control how hot it would get, but then also subsequently broke this rod because regulating its temperature meant that it heated and cooled, hence expanded and contracted, too quickly. So he broke two of these expensive tubes right off bat (and has since gone through 10 more), but there was promise! As Dave always does in the end, he decided to make own because 1) it was cheaper and 2) he could customize it to suit his purposes. He put a 4” heating element in the end of 316 stainless steel tube, insulated it with mica tape, and put on a nice heat-resistant grip, and took the whole setup from 1200 to 800 watts. He soldered together an angled holster with a thermal couple so that the temperature would be regulated while the poker was resting in its base (1000°F), but could still get incandescently hot (well past 1700°F, which is the ignition point, but anything above 1750°F exponentially decreases the life of the poker ) when taken out. He built a large metal box to mount the holster so that it couldn’t tip over and fall, thereby injuring someone, and equipped it with a power switch and temperature display on the front. Dave, the effect you note regarding the ultrahot poker not apparently heating the drink because it superheated and vaporized the surrounding liquid has a well-described physical basis, and is known as the Leidenfrost effect. This effect has several practical applications, as the vapor – as you found out – is a poor conductor of heat, including but not limited to allowing one to walk on hot coals (as long as their feet are damp/sweaty) and to pour molten lead into ones mouth without injury. It should be obvious that the hotter the coals/lead, the safer the trick. I use this effect in lab daily to use my bare hands to recover tubes from liquid nitrogen – the heat from my hands vaporizes the N2 creating a protective barrier allowing several seconds of rooting around for loose samples. Obviously application of a thermal barrier – like a glove – prevents the effect and causes frozen hands. You may want to contact someone at Watlow and see if the Ultramic heater (an advanced ceramic heater) might be a better fit. Smaller size, better control and much better ramp. Just a thought. I took a look at the Ultramic heaters, but the ones I saw only go up to 1112 F. Do they have one that will handle 1750 F? As I understand it, I am operating at the upper temperature limit of the internal nichrome heater wire. Have you looked at Watlow’s MULTICELL heater? The maximum operating temperature is 2250 F. A standard Incoloy FIREROD is only 1400 F. The MULTICELL also has multiple zones. Howdy Heather. Wow. Those seem nice. What is the sheath made of? Do you think it will throw oxides into the drink? Incoloy is pretty good about not throwing off a bunch of crud. How well do you think the Multicell would respond to repeated liquid quenching? BTW, another problem we were having with the Fire Rods was thermocouple failure. We lost 2 factory made embedded type k thermocouples. I suspect that the leads pulled themselves apart with the rapid expansions and contractions. I was able to embed my own thermocouple, but I had a lot of problems preventing the thermocouple sheath from shorting the heater after I drilled out the internal refractory. You frighten me David, why is the safety glove is the optional part? It looks really cool, but you definitely need to airbrush some flames on that bad boy… purple flames! Nice shots. I profiled the Red Hot Poker back in March on Cocktailians.com. Can’t wait to see Red Hot Poker v4.0! Have you thought of finding a way to bend the red hot tip of your poker at a right angle therefore giving yourself nice radius of safety distance to the boiling and flaming drink? Thank you for bringing the flips to the 21-st century. I hadn’t thought of that. I could easily engineer a bend, but I’d probably have to make a different holster or it would be awkward to extract. The pictures are really nice ! Firstly: The only thing I can get from the local welding supply shop is cold-rolled steel, not stainless. 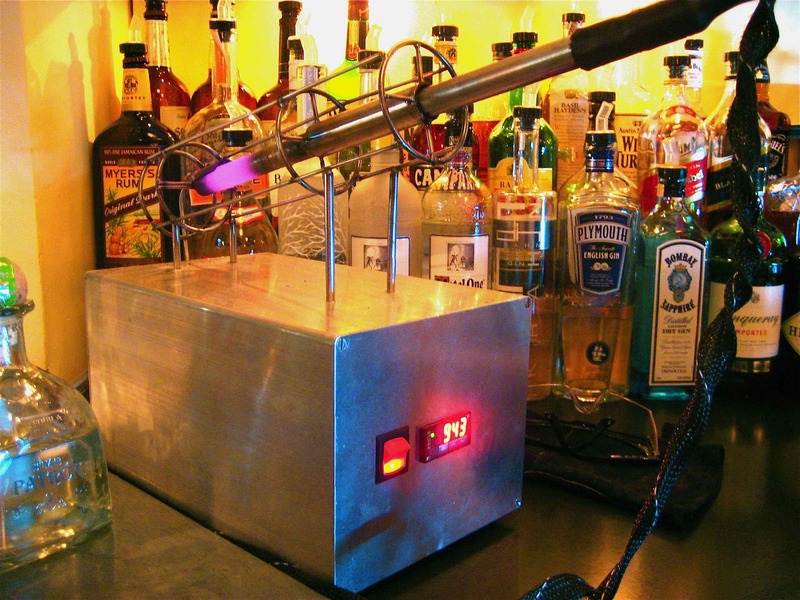 Conductivity aside, will it kill my bar patrons? Secondly: Can you pass along schematics for your poker? I want one. Hi Ian, I will work on it. The poker has some design issues that make it challenging. Maybe I’ll do another post. 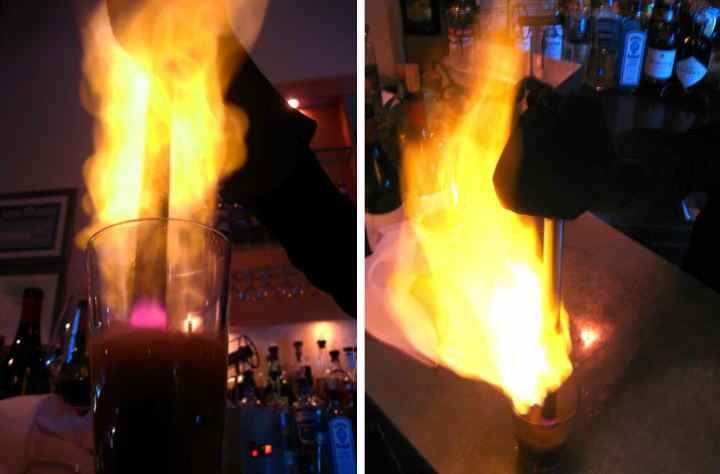 I’ve been doing some research for cold weather cocktails and came across your “red hot poker”. Any chances of getting more information/blue prints to make one? Crap. When we migrated some of the links broke. I’ll fix it.